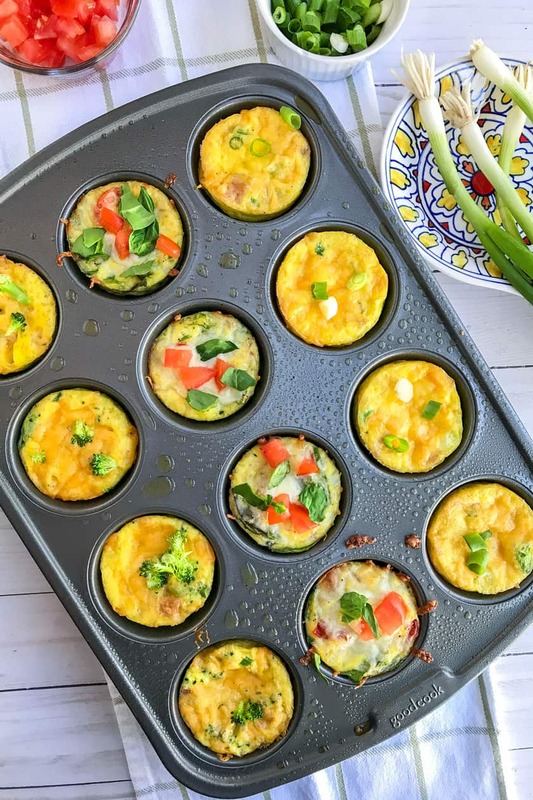 These make ahead Mini Frittatas are a favorite way to meal prep for the week. They’re healthy, fresh, and easily customized to individual tastes. Plus… they keep in the refrigerator all week long or the freezer for up to 2 months. Delicious bites of low carb, high protein goodness ready for busy mornings or healthy snacks. No time for breakfast? You will with these! Easy, on-hand, snacks or breakfast on the go. It all begins with a base recipe of a dozen eggs, sliced green onions, and salt and pepper to taste. From there, it’s up to your imagination. While there are countless combinations of frittatas, these are our favorites. The kids love them, as you will see in a photo below. The adults and older kids love the variety, the portability… and I love that it’s an easy weekend fix. That will last, maybe, all week long. Which, of course, depends on how many people are in the kitchen while I’m making them. 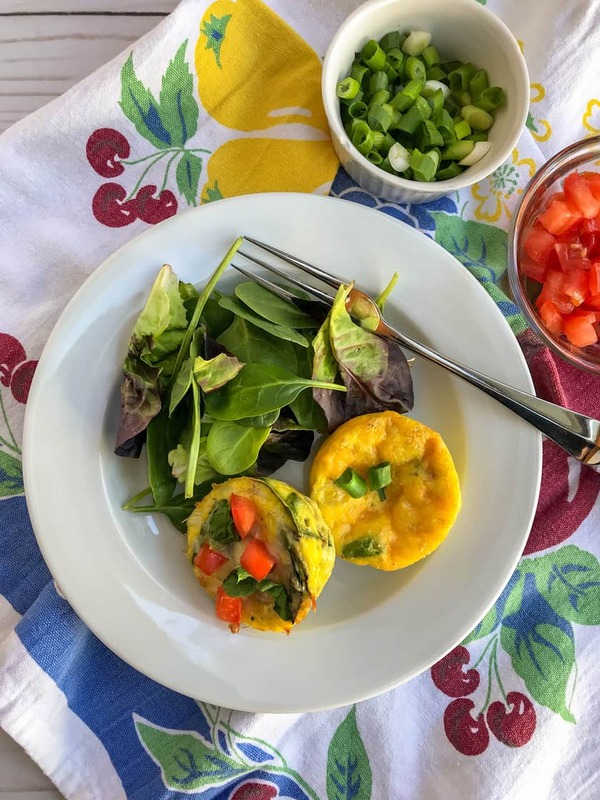 Always my mom’s favorite, this frittata is a combination of healthy greens, chopped or halved cherry tomatoes, and sprinkled with shredded mozzarella. 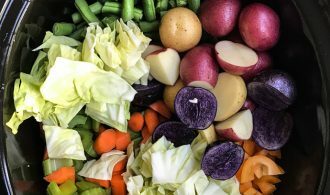 Use your favorite green, or what you have in the produce bin. Almost any green works! With two simple ingredients, (bacon and shredded cheddar cheese) this is a perennial favorite with the kids. I will cook 4 slices of bacon, drain, and crumble. That gives me enough for the frittatas, a few extra to garnish the top, and a few to nibble on too. 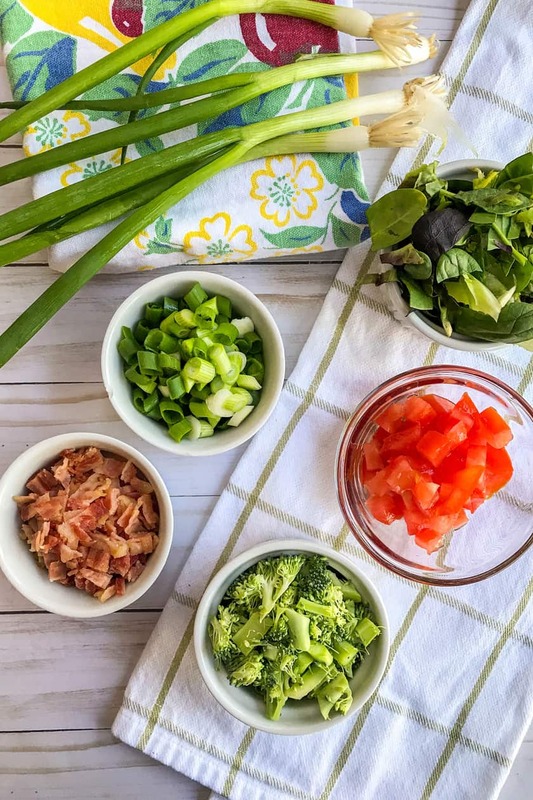 This frittata requires only two ingredients as well; thinly sliced broccoli florets and shredded Cheddar Cheese. To that base, I will often include a dash of garlic powder and some red pepper flakes, depending on the eaters that week. Often, this is the one I reach for first. 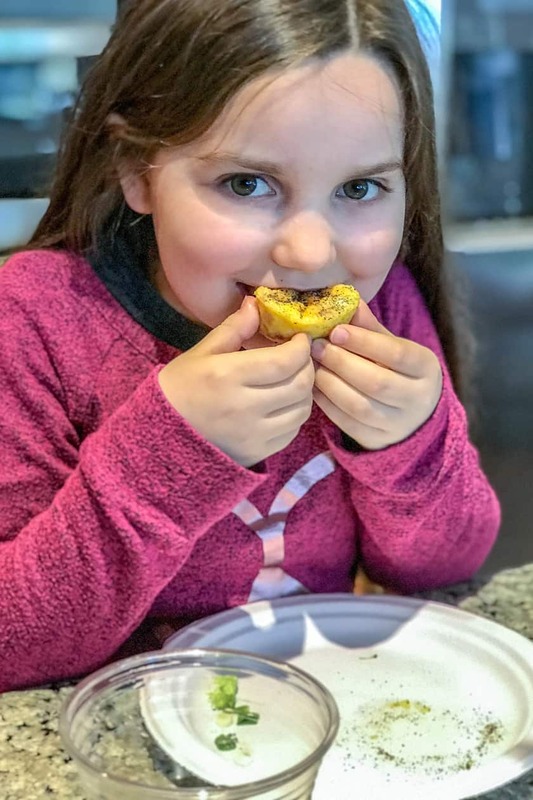 My niece, Isabella, is my favorite helper in the kitchen. Such a sweetie, she helps make, taste test, and even set up photos. As you can see, she likes to add a bit of pepper. The Bacon and Cheddar Frittata is her and her brother’s favorites! 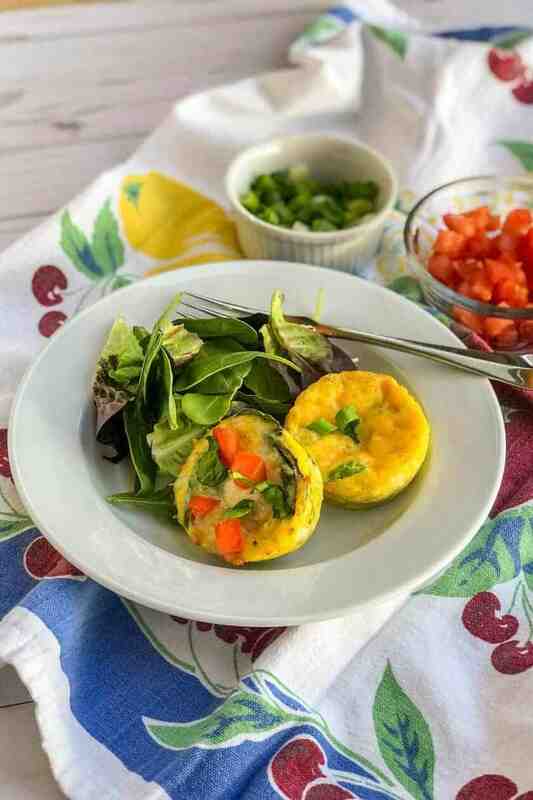 These Mini Frittatas are easily made in a nonstick 12-cup muffin tin. While you can use paper to line the muffin cups, I prefer to generously coat with cooking spray. Fill each muffin cup 1/2 to 3/4 of the way up the sides of the tin. Then add the toppings before baking. After the frittatas bake in the oven for 20 minutes, let them cool in the pan for an additional 5 minutes. Then, using a spatula or plastic knife, gently loosen the frittata from the edges of the cup and serve. Quite often I will prep additional veggies to serve alongside the frittatas. Chopped avocados are incredible, and a green salad is always a good choice. 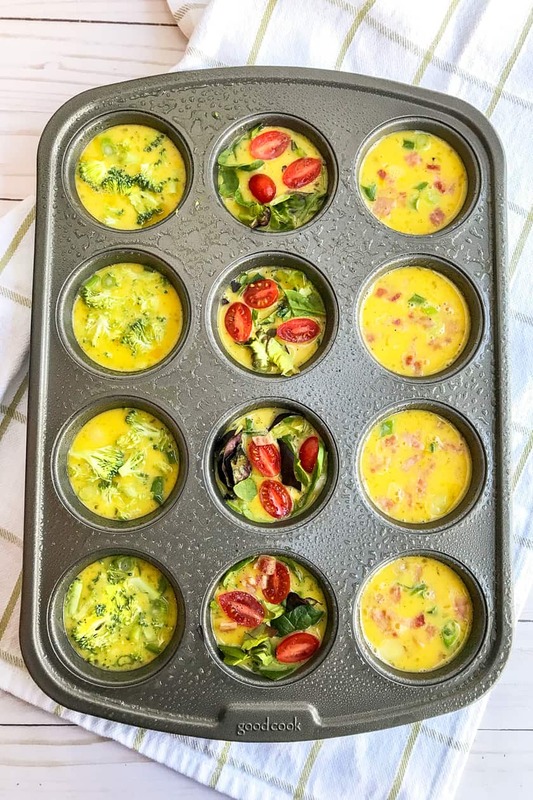 How to Store the Mini Frittatas? 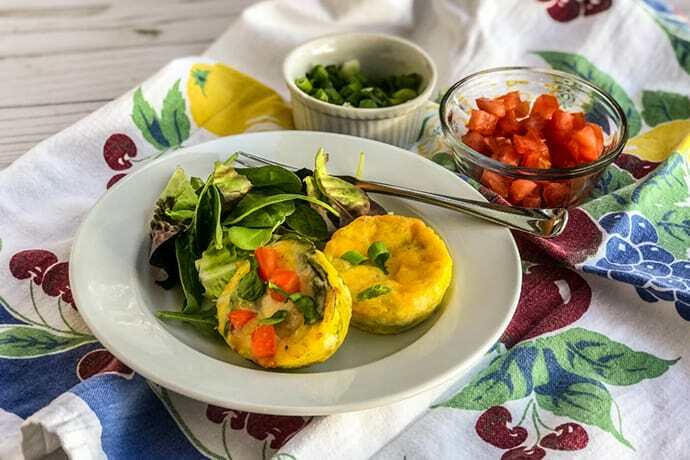 These frittatas will keep refrigerated in airtight containers for up to 5 days. Then, reheat for 10 to 15 seconds in the microwave before eating. Although… they’re super good cold too. Yes, from personal experience, although I think I’m the only one in the family to eat them cold. After the frittatas have completely cooled, wrap individually in plastic wrap then add to a freezer zip-top bag. 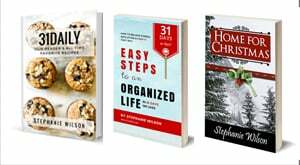 Freeze for up to 2 months. 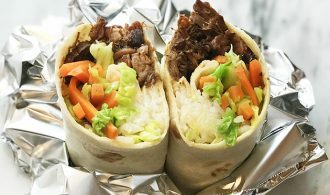 To reheat, remove the plastic wrap, and then wrap in a damp paper towel and microwave in 20-second increments until warm. This Make Ahead Meal Prep Mini Frittatas recipe is part of a collaboration of awesome foodie friends, suggested by Nicolas Hortense of BlogTasticFood.com. Thank you, Nicolas, for including us!